» Hemp protein Hemp University hemp protein | hemp protein powder | hemp nutrition-What is hemp? Hemp seeds have many nutritional benefits that our bodies can take advantage of in things like hemp milk and hemp protein powder. Hemp contains a high proportion of amino acids in ratios best suited for human assimilation. The hemp seeds protein content is approximately 23%. 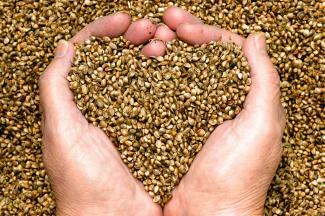 Hemp seeds also contains essential minerals including Calcium, Magnesium, Phosphorus, Potassium and Sulphur. It is, however, low in heavy metals such as strontium, thorium and arsenic chromium. Heavy metals should be avoided in a healthy diet. Hemp seeds are also high in dietary fibre. Hemp seeds provide Essential Fatty Acids (EFA’s) Linoleic Acid (LA) and Linolenic Acid (LNA) as well as containing Gamma Linolenic acid (GLA). Of the fat in hemp seed, we have found 56% is Linoleic and 19% is Linolenic (a ratio of 3:1 is considered the optimum balance). Furthermore, oil from hemp seeds is far more valuable, in terms of concentrated nutrients, than soybean the nearest vegan alternative. EFA’s are required by the human body in order to maintain hormonal balance, healthy skin, hair, general health and well being. The body is, however, incapable of producing EFA’s and it is therefore necessary to ensure that they are consumed by the body as a part of a balanced diet. essential fatty acids available in hemp seeds are accountable for the responsiveness of our immune system and they do not raise cholesterol levels. In fact EFA’s help to clear the bodies arteries. Because hemp seeds are so digestible, scientists are suggesting their use in medicine to blocking diseases and in treating malnutrition. Tests are currently in progress with regards to EFA’s in treating cancer and helping to support the immune system of those with the HIV virus. Advice gathered from Government scientists and from the health food industry generally suggests that our regular dietary habits require a reduction of fat intake. Humans MUST consume fat in order to obtain an adequate supply of the two essential fatty acids (LA and LNA). This is the reason that they are referred to as ‘essential’ and the rest are merely fatty acids or simply ‘fats’. Over-consumption of saturated fat is harmful. Research links essential fatty acid deficiency with cancer, cardiovascular disease, auto immune disorders, impaired wound healing, breast pain, pre-menstrual syndrome, hormonal imbalance, multiple sclerosis, skin and hair disorders. The type of fat in one’s diet is therefore critically important. If then we increase intake of EFA’s to 12-15% of our total daily food consumption then this alone quickens our metabolic rate. This results in a thermogenic reaction causing fat burn off and loss of excess weight. LA and LNA also substantially shorten time required for fatigued muscles to recover after exercise and they facilitate the conversion of lactic acid to water and carbon dioxide.